Great cycling is back on the roads of the Lombardy region. On Saturday 13 October the 112th edition of Il Lombardia will start from Bergamo and finish in Como after 241km. 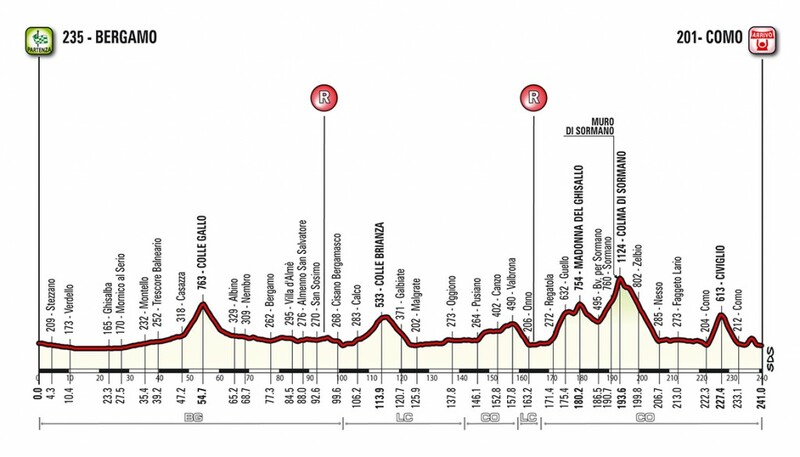 The “Classic of the Dead Leaves”, the last Classic Monument race of the season, will run almost on the same route as last edition, when Vincenzo Nibali rode to a solo victory, with the only modification being in the finale. It’s a highly selective route with six climbs and 4,000 meters of vertical elevation. The first climb, Colle Gallo, is followed by Colle Brianza; and after the town of Onno the riders climb the Madonna del Ghisallo, followed by the Muro di Sormano. After passing the Colma di Sormano the race descends to Nesso and onto the Civiglio climb. After this climb in last year’s race the route turned left to climb Val Fresca towards San Fermo della Battaglia, but this year will go straight until Via Camozzi roundabout where it will meet the descent of the previous course to then face a short punchy climb, 1,700m long with 5% average gradient and a maximum of 9% to end in the Monte Olimpino hamlet. From here it’s just 3km to the finish line on Lungo Lario Trento e Trieste.